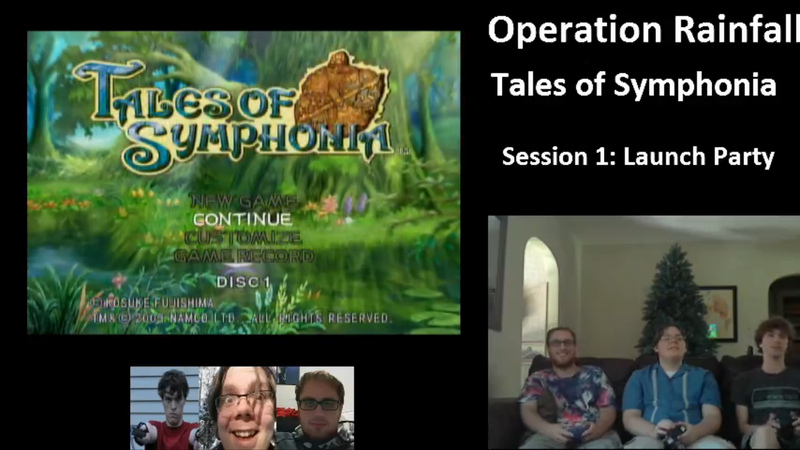 It’s the event we’ve all been waiting for: the big launch of oprainfall’s first-ever stream series on Tales of Symphonia. It came, and it went, after a solid three-and-a-half hours. How did it go? Well, ignoring a tiny technical blip early on, the first hour went really well. 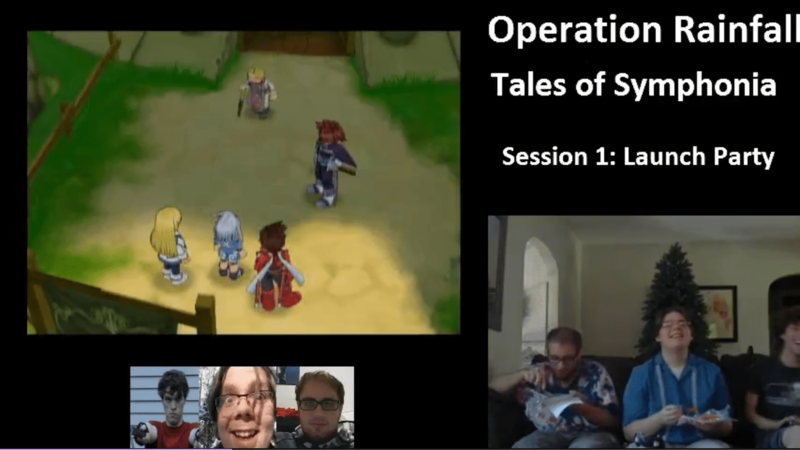 We learned about the main characters of the game: Lloyd, Genis, and their friend the Chosen One, Colette, who’s supposed to become a hero and save the world. We headed off into Martel Temple, where she was to begin her journey, and ran into the evil Desians. In a fight, we met Blindy McBlinderson—I mean, Kratos—who saved us from total defeat and agreed to help us. Martel Temple is the game’s first dungeon. It was tricky on Hard mode, but we got through well enough by spamming our healing items. That was when I brought out the real-life Apple Gels and Orange Gels (just like the game’s healing items) that I made, and the guys got to try the recipe. Unfortunately, it wasn’t enough, so we went back to a healing point that William—who had supposedly gotten every title in the game before—didn’t know existed. Back in the temple, we fought our way through and met Remiel, an angel and apparently Colette’s real father. He gave her a mission to go on a journey and unlock seals across the world. She and Kratos left, leaving Lloyd and Genis to…get massacred by enemies. Oops. Unfortunately, I had made one crucial mistake: I had only saved once, about ten minutes in. In desperation, we switched back to Normal difficulty and mashed A to get through the dialogue, making a sound that will forever be compared to castanets. That let us get back to that part of the game much more quickly, but from that point, we were much more careful to save, save, SAVE! After we had caught up, Lloyd headed home, but stopped along the way to meet Genis’ friend Marble. She’s a slave of the Desians, and we did what we could to help her using our temporary superpowers. [He means being able to jump up normally impassable cliffs in cutscenes.—Ed.] That path led us to the home of Dirk, a dwarf who is Lloyd’s adoptive father. Lloyd and Colette talked on the balcony, where we noticed the blue moon, leading to an important question: how come there are so many regions in real life where people don’t have Blue Moon ice cream? Or Superman ice cream? Clearly, this has to be rectified. Many of our viewers didn’t have a clue what we were talking about, but clearly, it was an important discussion. The next day, Lloyd discovered that Colette had left without him. Before he could learn the truth about her, though, Desians invaded the village. 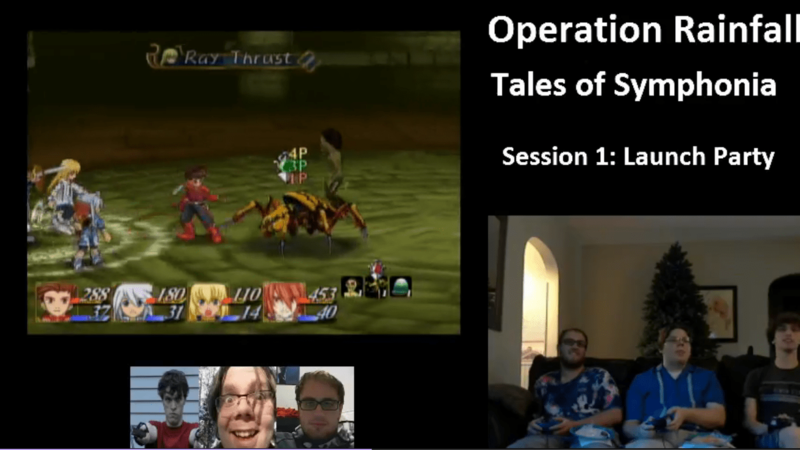 They came for Lloyd and forced him and Genis to face a hideous monster. We had another close call against this boss, but we defeated it, only to discover it was really Marble, mutated by the power of an Exsphere. 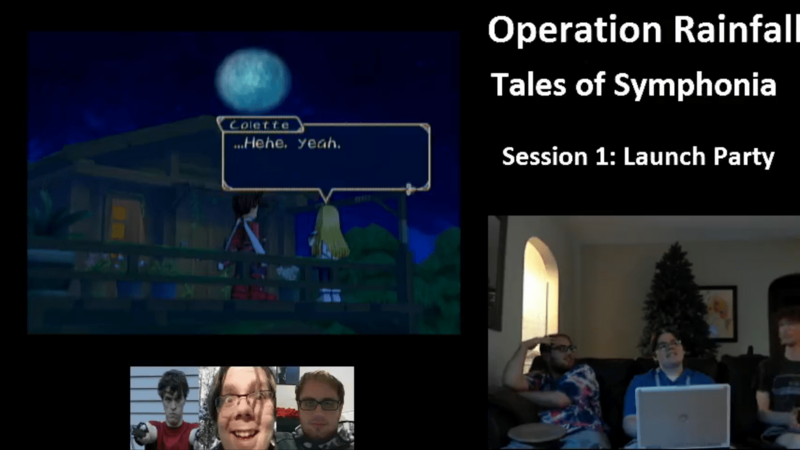 After a heartbreaking scene, Lloyd and Genis are exiled from their village, only to be caught by Desians later on. Fortunately, the rest of the party came to the rescue, because I’m pretty bad by myself. We went back to town to learn more about Exspheres before finally setting off for the Temple of Fire, the first seal on Colette’s journey. The area gave us a lot of trouble, especially the boss, leading us to finally agree that we could stay on Normal mode until we had time off screen to level up a little bit. Once we did that, we had a little more luck. With some effort and teamwork, we managed to defeat the guardian of the seal and unlock it, gaining Colette her angel wings. There, we finally finished for the night, promising to be back next time to cross the sea and unlock the second seal. 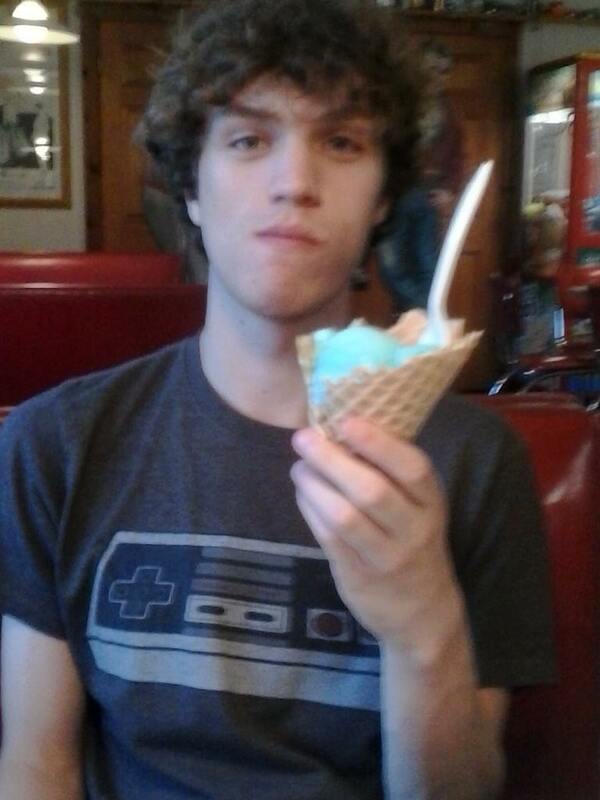 For now, though, we’re getting some Blue Moon ice cream. 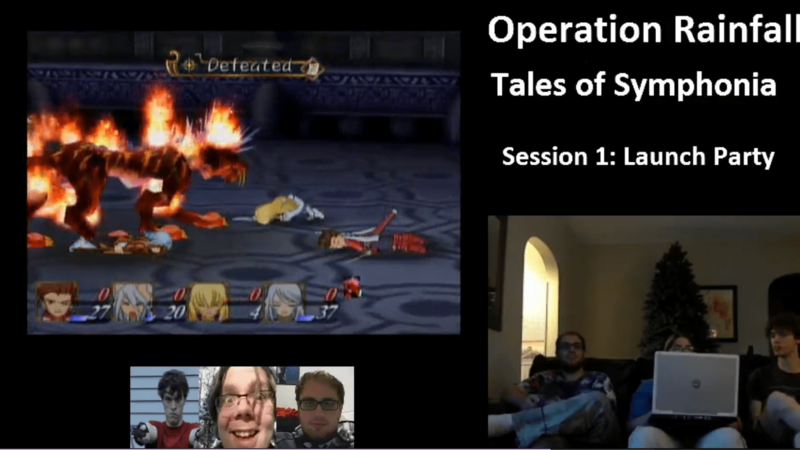 You can watch the entire stream, segmented into 8 videos, on our Twitch channel. That’s also where you’ll find us this Saturday, July 27th, for Session 2, again at 5PM EDST. Hope to see you all there!